Thank you for visiting Cooking at Cafe D.
If you new here, welcome! This baklava post is an oldie, but goodie. Please take a moment to look around. On your right you'll see various ways of keeping in touch through social media, rss, and e-mail. And, there are categories - LOTS of them - whether you are looking for something Healthy, Quick, Inexpensive or even Soup-A-Licious. As you know from our post, Gettin' Greeky With It, one of our meals this Christmas had a decidedly Greek theme. And, Mr. Baklava came to dinner. so I used a tried and true recipe from my friend, Peter J. Rudy. To my taste buds, it was perfectly tasty. His recipe with his comments are in azure blue. My ramblings are in a shade of maize. Makes one 9x13 glass pan of goodness. Serve with strong coffee or a couple of gallons of milk. A syringe of insulin might also prove to be handy. Defrost the phyllo according to the directions on the box. Chop nuts in food processor until slightly coarse. (I find it easier to do the almonds first, then add the walnuts and pulse a couple times more). Add sugar and cinnamon and pulse a few times until combined. Transfer to medium bowl. Don't have a food processor? No problem. Take 13x9 Pyrex pan and place on counter with the bowl of nuts next to it. Take the phyllo out of package and unroll. They will likely be 13x9-ish. (If you got the huge sheets, slice in half the short way and the resulting halves should be only slightly larger than the pan.) There are also packages that have the phyllo in two wrapped packages. these are already the right size. You really need to keep the dough moist while working with it. It's easy, just do it. You will want to wet two still-connected paper towels and wring most of the moisture out and keep them on the phyllo when you're not taking a sheet. Failure to do this will result in disaster in a short time. 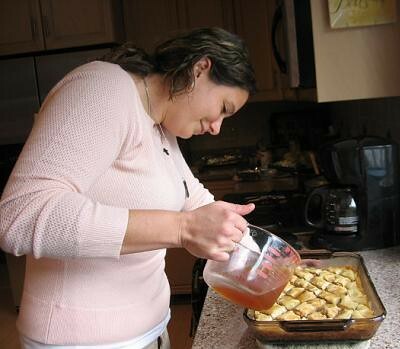 Greek grandmas and aunts will sometimes use a kitchen towel. Whatever floats your boat. With a pastry brush, coat the bottom and sides of the pan with melted butter (I keep the butter in the saucepan I melted it in on the lowest burner setting at all times). Take one layer of phyllo and lay it on the bottom of the pan. (Me? I buttered my bottom.) If it's slightly too long or wide, just fold the edge over, it's okay. Cover the remaining phyllo and brush the sheet in the pan with more melted butter. Repeat five times so that you have six layers of phyllo and butter on the bottom. Besides providing flavor, you are creating a fat layer between the pieces which gives it the flaky crispy texture - while keeping it from simply being layer upon layer of dry stuff that sticks in the back of your throat. This fat layer is important. I heard someplace you can use oil. I suppose you could do that...I'm sticking with butter. Then take a handful of the nut mixture and sprinkle over the top. Spread it around so that it covers in a thin, even layer. Take another phyllo sheet and lay on top of the nut mixture. This next phyllo layer (the one that goes on the nut mixture) is always the hardest to spread the melted butter onto. You may have to use your fingers to keep it in place. 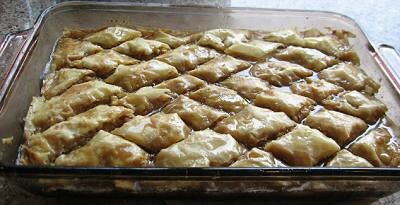 Once it's buttered, repeat the phyllo and butter process two more times so that you have three layers on the nuts. Spread more nuts as before. Continue the nuts and three layers of buttered phyllo process until you have five or six sheets of phyllo left. This will be your top layer. These get the individual butter treatment as well. You have to cut it into diamond shapes. I find it easier to make nine or ten cuts parallel to the longest side, then diagonal cuts. Um, I didn't follow his directions. So, my pieces have that, er, "rustic" look. Sure, that's the ticket. They're "rustic." I'll be following his directions next time... You will need a sharp knife to do this. Dip the knife in hot water if it sticks and the phyllo starts to pull and tear. Once it's cut into diamonds, pour any remaining melted butter evenly over the top. Then put it in the oven. Bake 55-65 minutes, but I'd check after 45 minutes just to be sure. The top layers should be tinged with light brown and because it's a glass pan, you should see slightly darker orange layers at the bottom. Take the syrup out of the fridge, take out the cinnamon stick and cloves, and spoon the syrup all over the baklava. I tend to follow the cut lines, but just make sure that every piece gets some luscious syrup and don't forget the edges. Oh, we didn't read that part either. We poured it right outta the pan - well, outta a measuring cup. The cold syrup on the hot phyllo bubbled and gurgled and sputtered. Here's a shot of my niece - with the hot molten lava of love. Cover loosely with foil and put in the refrigerator to cool. Make some...and let us know what you think! I have always wanted to make this! Thanks so much for the recipe! I am going to print it out and give it a try. I will let you know how it turns out. LOOOOOOOOOOOOOOOOOOOOOOOVE this recipe!!!!! going to make it really really soon!!!!! : ) hugs and thanks for sharing! Andrea, I'm so glad you found us! 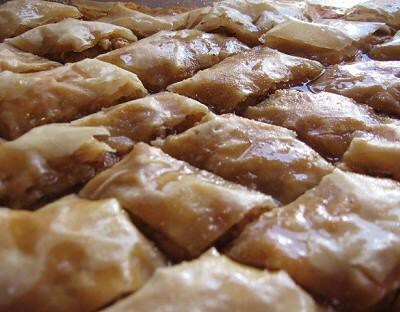 If you try the baklava recipe, please let us know what you think. You can find us on Facebook, too! This looks pretty authentic to me. Good recipe!